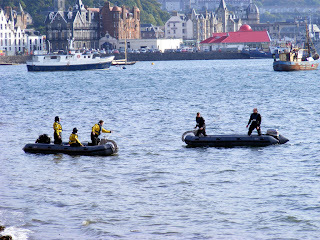 A minor incident occurred whilst transferring personnel between RN minesweepers, Oban Bay, 26 September 2008. 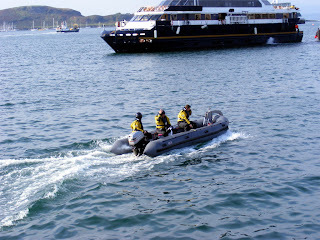 All appeared well as the RIB left Bangor at the North Pier heading for Penzance lying outside the bay to the West. 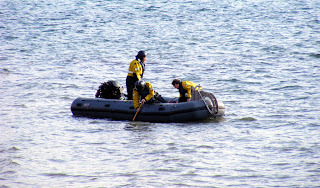 Oops, just off the Cathedral, the outboard gave up! "Of course I can't fix it, I am used to bigger engines!" 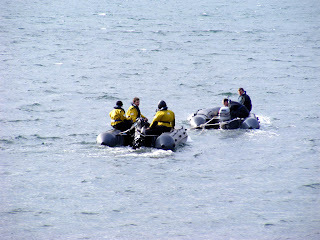 It was then discovered that they were off a lee shore in a mild south-wester. "How do we work these again?" Hurrah! 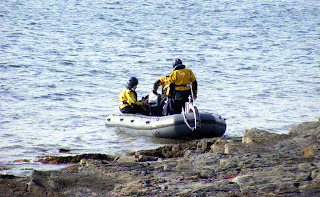 Rescuers appeared from Bangor. "Catch (please?)" Finally the tow was made fast and an ignominious end to the journey began. I'll bet the Skipper of Penzance will have a few words to say about maintenance etc. !